Thomas Henry Belfield was born in 1893 in Chilwell, Nottingham2, the only child of Thomas William and Selina (née Pare) Belfield. He was baptised in Attenborough Parish Church on 1 October 1893. Thomas William worked as a joiner in a local lace factory, most probably at Pollards factory in Beeston. In 1901, the family, including the seven year old Thomas Henry, was living on East Gate (later Park Road), Chilwell3. Two of Selina's siblings and a sister-in-law were living with the family. By 1911, the family were still living on Park Road, with Selina's father, now an 84 year-old widower, and her brother, now also a widower. Thomas Henry had started work as a lace threader, probably with Pollards.4. Although living in Chilwell, the family had strong Beeston connections. Thomas William's father, Henry Belfied (c1823-1887) and his wife Emma (née Burnham, sister of Edward, landlord of the Royal Oak) had moved there in about 1849 and all but the youngest of their seven children were born there - including Thomas William in 1861. Henry became a well established baker on Chapel Street, Beeston, a business that was continued by his son John Henry Belfield (c1859-1929)5. Although no record has been found as to the specific date, it is likely that Thomas Henry enlisted early in the war with 3rd Battalion, Grenadier Guards, then stationed at Wellington Barracks, in London. After initial training, he and the rest of the Battalion was mobilised for war on 26th July 1915, landed at Le Havre on the following day and, in the following month, became part of 2nd Guards Brigade of the Guards Division. The Battalion then took up positions in the Ypres Salient where it was to see action over the next nine months6. At the beginning of April 1916, the battalion was position in trenches in the Ypres Salient that had been heavily shelled with much water standing in shell holes. After a brief respite, the battalion was back in the same line which was found to be worse than ever, having been again heavily bombarded. On the 11th the battalion moved to good billets in Poperinge but suffered casualties when the town was shelled. After a week, the battalion moved into support in Ypres and alternated between there and the front line8. It was during this time that Private Belfield was killed in action. 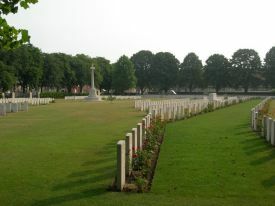 Private Belfield is buried in what was then known as the "Cemetery North of the Prison" and now "Ypres Reservoir Cemetery", near the western gate at Ypres, between the prison and the reservoir. It now contains 2,613 graves including burials removed from two other nearby cemeteries and others from the battlefields in the salient. Of these, 1,034 are identified.7. He was posthumously awarded the 1914 Star, British War and Victory medals9. In addition to the Beeston memorial, he is remembered on memorials in Attenborough Parish Church, Chilwell Memorial Hall and Christ Church Chilwell. 2His birth was registered in Shardlow Registration District in Q3 1893 (Ref 7b 509). 31901 Census for Chilwell, Notts - Piece 3208 Folio 17. It appears likely that Thomas William was the 'Tommy' Belfield who was the head of Pollard's fire brigade and appears in the Brigade photograph here. Arthur John Pollard served as the Executor of his will following his death in 1947. 41911 Census for Chilwell, Notts - Piece 20822 RD434 SD4 ED1 Schedule 211. 5More on the Belfield family can be found by following the story of Emma Burnham at www.beeston-notts.co.uk/burnham.shtml and the 'next generation' link. 6Based on details included in https://ww1ieper1917.wordpress.com/2013/06/26/the-british-grenadier-guards-during-world-war-one. 7Description of the actions are based on the account in the Battalion War Diaries.